As it’s Oscar time, I thought I’d write a short piece about the 1993 Oscar winner “The Piano”. Why? Because it won 3 Oscars and a piano is pivotal to the plot. I was busy researching and writing the piece (some of which follows) but I was thinking that the item didn’t really have any newsworthy element to it. But I was wrong. It turns out that there was a mistake in the Oscar proceedings, which actually brings some relevance to the piece. Although it is not the mistake you think. There is normally a section in most awards ceremonies that lists those who have died from the industry in the past year – a memorial to those who have served. Amongst the list at this years Academy Awards was that of Janet Patterson. She was a very talented Australian costume designer who had previously been nominated four times for Oscars. She died October 2016. Unfortunately the picture captioned with her name was that of Jan Chapman, the producer of… “The Piano”. Reports have it that she was not at all pleased by the mistake, especially as Ms Patterson was a good friend of hers, and was also Oscar nominated for “The Piano”. Set in the 1850s, the film deals with the life of a mute Scottish woman sent by her father to New Zealand for an arranged marriage. Her prize possession is a piano, which despite considerable logistical problems she takes with her. And it is the piano that provides the powerful imagery that runs throughout the film. 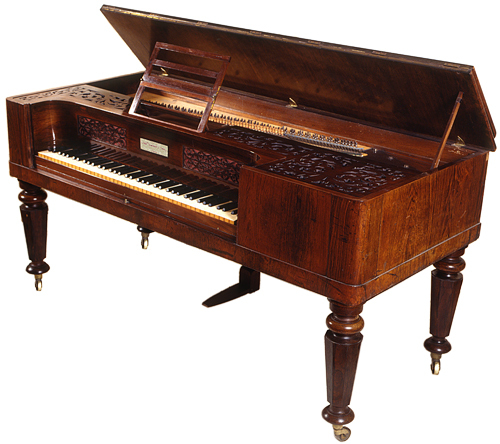 The piano used was a Broadwood square piano similar to the one shown here (though this was made in 1860). Broadwood was the leading manufacturer of square pianos in England at the time, and was responsible for many of the technical developments. PLOT SPOILER: It has been reported by several sources that the film-makers got things wrong with part of the film. Some said that when the piano was thrown into the sea, that, having a wooden frame, it would float. This is unlikely. Broadwood introduced a partial metal frame (metal hitch pin plate) in the 1820s, and by the 1840s a full iron frame was being used. The piano used in the film was made in 1839, and would have weighed virtually the same as a grand piano of the time. I reckon it would have sunk like a stone! But being so heavy, it would have been really difficult to transport to a New Zealand beach. The “piano” used for the beach scenes was not a fully functioning instrument, but a mock-up. A “piano prop” if you like. It was allegedly made by Broadwood, and sold in August 2013 for 1000 NZ$ (c. £600 / 700 US$). The film won Best Original Screenplay, Best Actress and Best Supporting Actress Oscars. Although nominated for Best Picture, it lost to Schindler’s List. Perhaps there was a mix-up with the envelopes? If you’d like to see more of “The Piano”, do visit the Miramax website.